I am excited for Thanksgiving this year. Honestly, holidays can be really hard for me, as they are for many people. I’ve found that by focusing on the kids and new traditions, the holidays seem easier. They are so full of wonder at this age and I find it easy to get enraptured in their wonder. So we are going full out on holiday traditions. Halloween starts today at our homeschool group and won’t end until Halloween night. And we will pick up right with Thanksgiving traditions on November 1st! 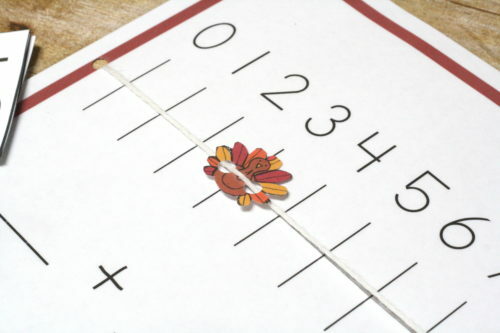 And I love having printables like the turkey number line to bridge the gap between holiday, tradition, and school. 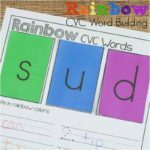 We are nearing the end of the 31 Days of Printables but Ill let you in on a little secret – we have our next project planned for printables and it’s not that far off. The details will be in the newsletter first, so sign up to be in the know! 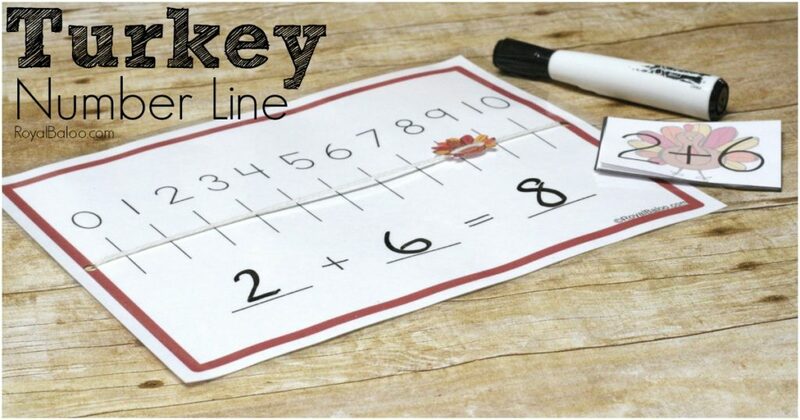 I’ve made a few of the number line pages now and I find they just have to be laminated. It works so much better. 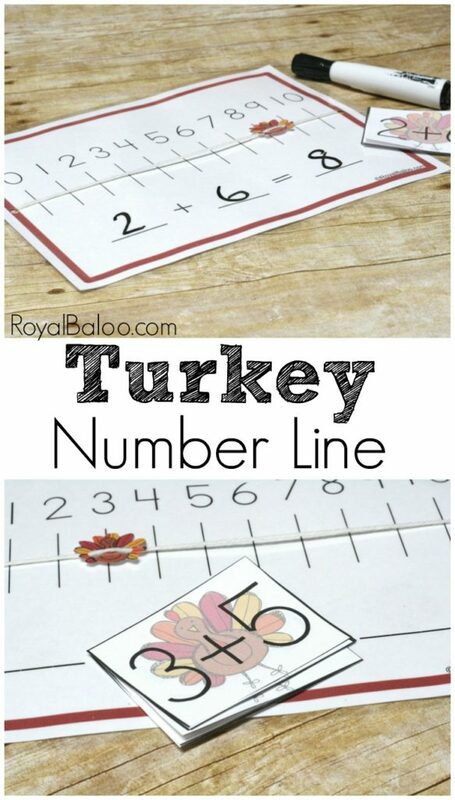 To put the number line together just laminate, hole punch on each side, and attach some yarn. I push my yarn through and tape on the back. Make sure to add the little turkey before taping the 2nd side down! And make sure you number line in taut but not so much that the page bends. I didn’t laminate my flash cards because I don’t think we will hold onto them for long. But if you think you’ll use them multiple times, definitely laminate. We use our number lines in a pretty straight-forward manner. With the cards, we just draw a card and work out the equation. Nothing fancy to it! The cards with the turkeys in the background were kind of exciting though. 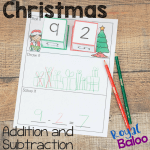 You can easily incorporate the number line into your regular math lessons though! I keep one or two of these in our drawer at all times. When one of the boys is having trouble with an addition problem, we can just pull it out and work through it. The cards are so cute, I just had to do a close up. And the little turkey deserved a close up too! Usually I have the string going behind, but I wanted to be able to see the turkey’s feathers! Either way, to add the turkey, just hold punch twice (once on each side) and slide him through! 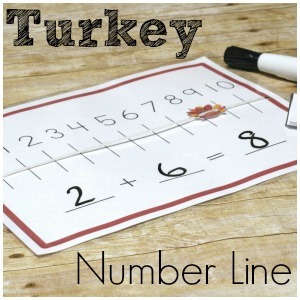 Go Here to Download the Turkey Themed Number Line Printable! And don’t forget to sign up for the printable newsletter to be up to date on all the shenanigans we will be getting into.